Good morning, nothing like a hearty breakfast to kick-start a day, and first meal of the day is incomplete without a yummy beverage to wash it down. Lucky to be a Malaysian, we are spoil of choices when it comes to drink for breakfast. Some of us prefer to sip coffee or tea to give our sleepy body a jolt, some lift their mornings with malt beverage or juices and some even skip their breakfast. Thank you Dutch Lady for introducing me a new way for an energetic and healthy lifestyle. 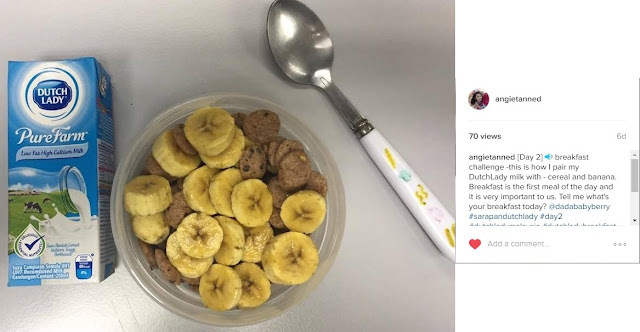 I was very pleasant surprise when I receive a big breakfast and 7 packs of DutchLady milk in my office by DutchLady Malaysia. All my colleagues surrounded me and envy me. Hahaha!!! Sausage egg muffin and golden harsh brown pair with my DutchLady milk. Excellent!!! 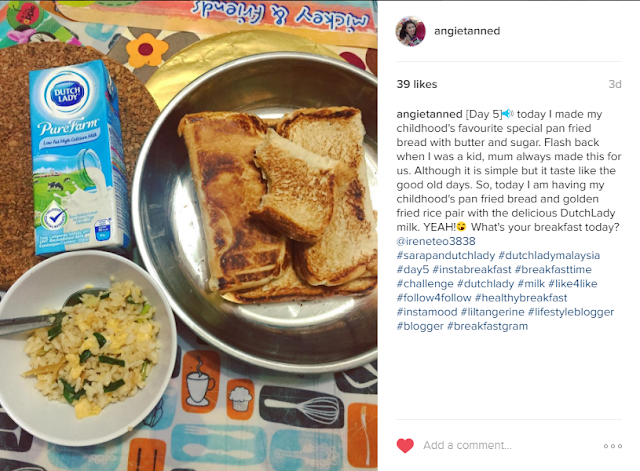 My childhood's pan fried bread and golden fried rice pair with my DutchLady milk. Malaysian's favorite breakfast Nasi Lemak pair with my DutchLady milk. Perfection!!! Malaysian's favorite breakfast 2.0 Roti Canai pair with my DutchLady milk. Dutch Lady Malaysia encourage Malaysian families to load up on milk before work or school. Just two serving a day helps meet a family's nutritional requirements. Having one of the two servings at breakfast pumps at least 200mg of calcium into the body. 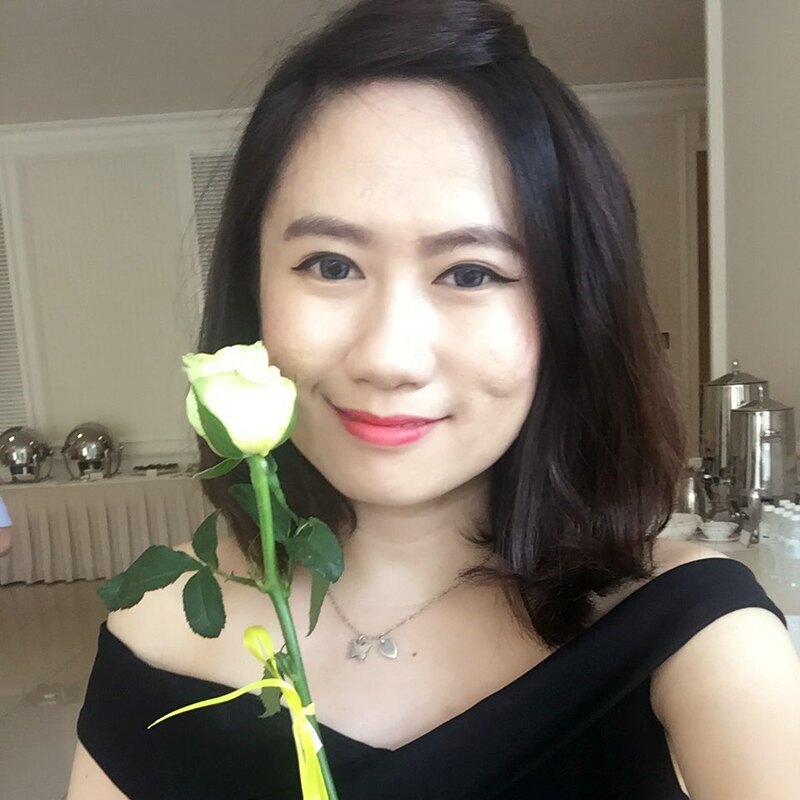 Did you know Malaysians don't meet calcium requirements? 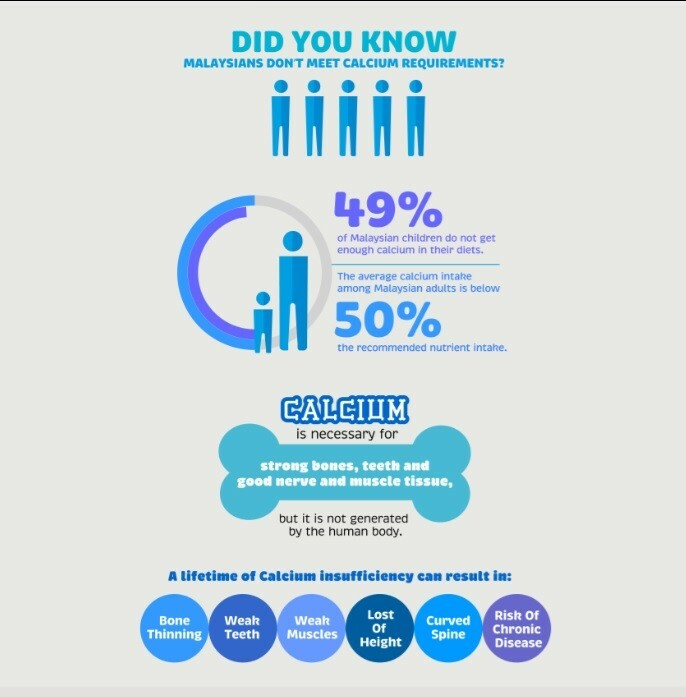 49% of Malaysia children do not get enough calcium in their diets. And, the average calcium intake among Malaysia adults is below 50% of the recommended nutrient intake. We have to bare in mind how important is calcium for strong bones, teeth, good nerve and muscle tissue. But, its not generated by our human body. A lifetime of calcium insufficiency can result in; bone thinning, week teeth, weak muscles, lost of height, curved spine, and risk of chronic disease. This is the reason why Malaysians don't consume enough calcium. Sadly, most of Malaysians stop drinking milk which is a primary source of calcium past childhood. Hence, milk is typically consumed at breakfast but at least 50% of Malaysians have breakfast irregularity. Let see how does milk at breakfast fix this? Milk contains several important nutrients that gives you calcium, protein, iodine, potassium, phosphorus and vitamins B2 and B12. 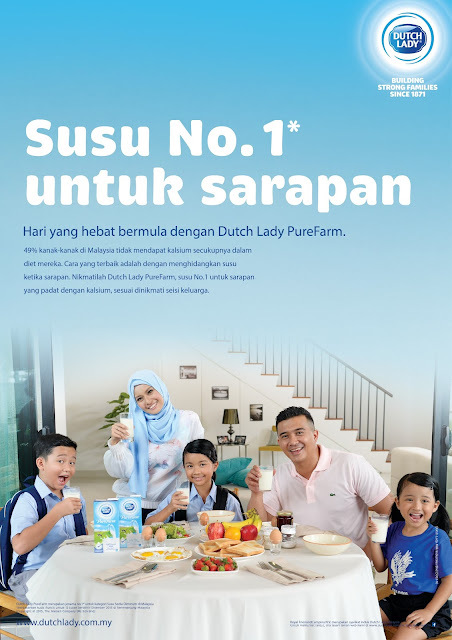 Dutch Lady PureFarm Milk benefits us more than just a calcium. For example is protein which plays one of the lead roles in our growth and development. Vitamin A, a crucial for healthy eye function, Vitamin B2 supports cellular functions that transform food to energy and Vitamin D3 aids absorption of calcium and phosphorus. The elders always tell me about how important is calcium for our own body. You will never get to resist calcium, so quickly encourage your family to start drinking more DutchLady's milk to gain calcium and nutrients. 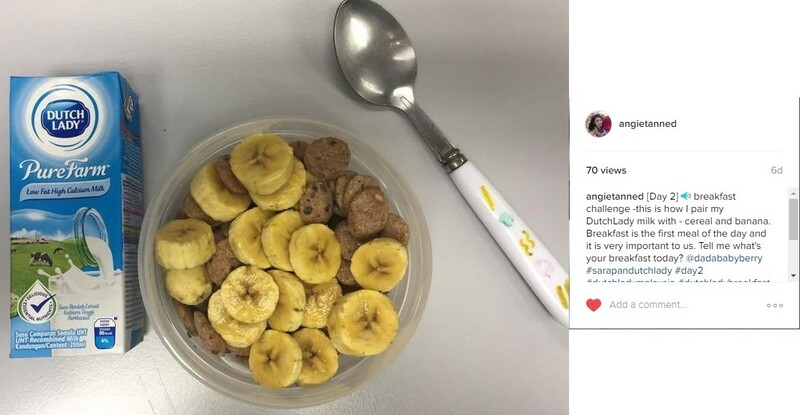 After taking this 7 days breakfast challenge, I will start my daily routine by drinking 1 serving of milk for my breakfast to boost up my nutrients. Tell your beloved family and friend uplift their breakfast with Dutch Lady PureFarm milk, which is available at all major stores nationwide. 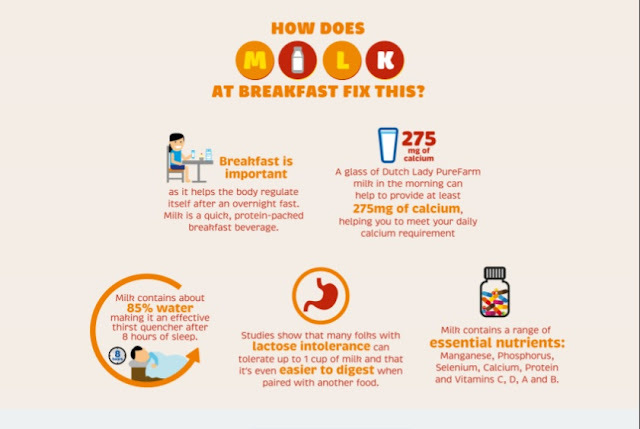 For more information on how you can incorporate DutchLady PureFarm milk in your breakfast, go to Dutch Lady page on Facebook.